There is a strong relationship between age and television news habits. Younger adults are less likely than older adults to often get news via all three TV platforms. For example, just 8% of those ages 18 to 29 often get news from network TV, compared with 49% of those 65 and older. Education and income also play a role in local and network TV news consumption habits. 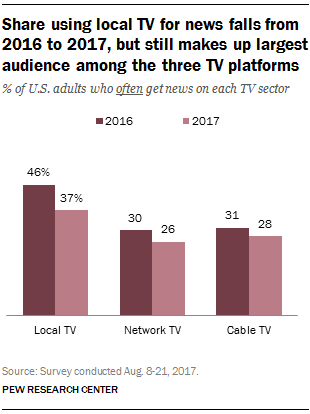 For instance, among adults who have completed college, 26% often get news from local TV and 21% from network TV – much less than those with no more than a high school degree (47% and 31%, respectively). News use on cable varies little by education or income, however. Race and gender are factors only for local TV. About four-in-ten nonwhites (41%) often get news from local TV, compared with 35% of whites. Women are also more likely than men (41% vs. 33%) to often get news from local TV. The shares of nonwhites and whites and of men and women who often get news from cable and network TV are roughly the same. Some partisan differences also emerge in network and cable news consumption habits, but not for local TV. Three-in-ten Democrats and Democratic-leaning independents often get news from network TV, compared with 21% of Republicans and Republican-leaning independents. The pattern is reversed for cable, though: 26% of Democrats and Democratic leaners often get news from cable TV, compared with 32% of Republicans and Republican leaners. There were no differences by party in local TV news use (36% of Democrats/Democratic leaners said they often get news there, while 38% of Republicans/Republican leaners said this).